A replacement-level pitcher going eight innings in Dodger Stadium with just two runs of support has only an 18% chance of winning a game, but Ricky Nolasco won 2-0 under those circumstances Thursday. Value Add gives the team 0.18 for the win, while Nolasco is credited with 0.82 of the win to move up to 19th in Value Add (see pitchers ranked 1st through 210th below). 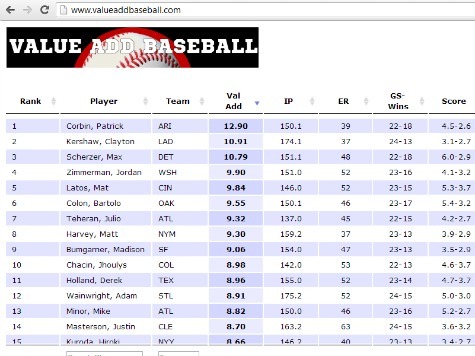 The www.valueaddbaseball.com database will be updated this weekend to include game-by-game accounts of 3,652 starts (any by a pitcher with at least five starts), 21,916 innings pitched with 9,485 earned runs allowed for a 3.90 ERA. The database also includes game-by-game breakdowns of the 15,321 runs scored to support these starters, as well as then 805 unearned runs allowed behind them, and 4,843 allowed by their bullpen, which totals 9,673 Net Runs of support for an average 3.88 ERA Needed to win. However, because any ERA Needed below 0.00 is recorded as a 0.00 for a given game, the actual average ERA Needed to win a given game is 4.65. The new rankings below are through Thursday’s games, so do not include Nolasco’s Friday night start, but in a four-game playoff series the Dodgers would now have four Top 20 pitchers. Clayton Kershaw is 2nd, Hyun-Jin Ryu is 10th, Zack Greinke is 18th despite missing a part of the season with injuries, and Nolasco was 31st before Friday’s start shot him into the Top 20. The Dodgers are also the only team with nine total pitchers on the list, as they had some terrible pitching early in the year before acquiring Nolasco from Miami. The only team with three Top 20 pitchers are the Reds (Matt Latos, Mike Leake and Bronson Arroyo) and the only other team with two Top 20 pitchers is Colorado (Jorge De La Rosa and Jhoulys Chacin) who go unnoticed as they pitch through the mile high air in Colorado.Here is the entire list through Thursday’s game. As always, make sure to follow our team on Twitter for breaking news and thoughts. I can be followed @jpudner, Tony Lee @TheTonyLee, Cole Muzio @ColeMuzio, Cameron Scales @CamScales, and Benjamin Chance @CBenjaminChance. Also, remember to follow our site @BreitbartSports.